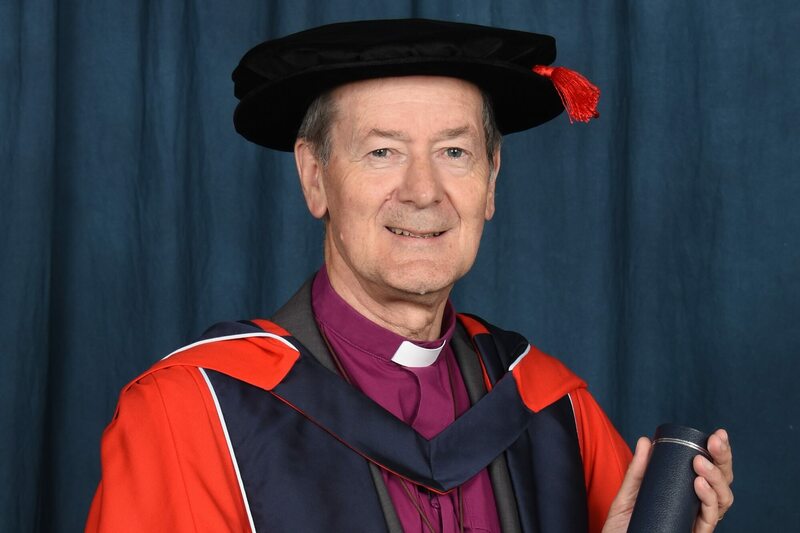 Chancellor, Pro Chancellor, Lord Lieutenant, honoured guests and graduands, it gives me great pleasure to be presenting today The Rt Reverend Dr Alastair Redfern, for the award of Honorary Doctor of Laws. Alastair has held the position of Bishop of Derby since 2005. He is a member of the House of Lords and is nationally and internationally renowned for his work on modern slavery. Over the years he has shown a deep and longstanding commitment to the life of the University, including serving on the University Court and holding the position of chair of trustees of our Multi-faith Centre. Alastair was educated at Christ Church, Oxford and began his ministerial career as a curate in the Diocese of Lichfield. He later became a tutor at Ripon College Cuddesdon, Honorary Curate at All Saints, Cuddesdon, and a Residentiary Canon of Bristol Cathedral, before becoming Suffragan Bishop of Grantham in the Diocese of Lincoln. As Bishop of Derby, Alastair has become an iconic and inspirational figure in our city. He has led the diocese through significant changes, establishing key partnerships between Church and community. The Redfern Commission, set up in 2012, has been especially significant in raising aspirations in our city. Alastair’s role working with the University has been a key part of our success. Chair of the Multi-faith Centre, with his guidance and challenge, we have provided a more inclusive and diverse environment, where both our students and staff can flourish without judgement or recrimination. His tireless contribution to social justice, tackling modern slavery, as previously stated, is internationally renowned. Alastair sat on the joint Parliamentary Select Committee drafting the Modern Slavery Bill, and subsequently supporting the legislation through Parliament until Royal Assent of the Modern Slavery Act 2015. This is an enormous achievement which gained international recognition, but was profiled through the City of Derby. In 2014, as part of this work, Alastair accompanied the Archbishop of Canterbury as the Church of England’s representative in Rome for the launch of a Joint Declaration condemning modern slavery in all its forms. The Joint Declaration has united world religious leaders in their campaign against enslavement and exploitation. Whilst Alastair skilfully balances his local, national and international commitments, he is also an accomplished lecturer, teacher and speaker with expertise in the fields of theology, church history, social justice, clergy training, leadership and spirituality. He has also found the time to write thirteen books. Alastair has immense qualities; integrity, modesty, passion, humility and determination are just but a few which we have all been able to observe and cherish during his time in Derby. Chancellor, in recognition of his fight against modern slavery and commitment to, and impact on, the University and the wider community, we are delighted to award Dr Alastair Redfern the honorary degree of Doctor of Laws.